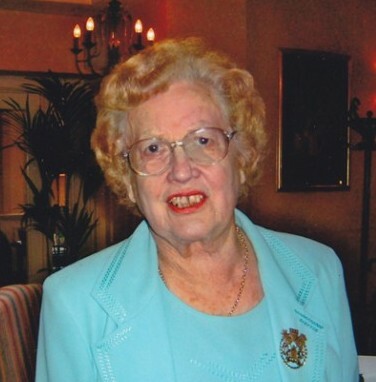 Eilish Ellis (née Clune) died at her home in Sandyford, Dublin, on Sunday 19 July 2009 in her 91st year. As a genealogist she was practicing up to some ten years ago, retiring from in-house researcher for the Genealogical Office, a branch of the National Library of Ireland. She was mentor to many of to-day’s practitioners, very generously giving time, encouragement, guidance and information to both novices and the small band of seasoned professionals. Eilish, of the Clune family of Quin, Co. Clare, whose father was the National School teacher, was first and foremost an historian. She graduated with a first class MA from the National University of Ireland (University College Dublin), with the added distinction of having been one among the first three MA students of Robin Dudley Edwards, (1909-1988), the newly appointed (1945) professor of modern Irish history at UCD. Eilish Clune married Henry (Harry) Ellis of Newry, Co. Down in 1946; it was a very happy and fulfilling marriage and the Ellis home in Sandyford, was an open house or a happy and generous home from home for their respective nieces, nephews and extended families and friends. Eilish worked with Robert C. Simington (1885-1976) on the Quit Rent Office records and by the mid 1850s she had joined the small freelance panel of genealogical researchers at the Genealogical Office, which was located in the Bedford Tower, Dublin Castle, having been invited by her friend Gerard Slevin, who had been from 1944 de facto deputy to Chief Herald and Genealogical Officer Edward MacLysaght (1887-1986) and on the retirement of Edward MacLysaght in 1954 was appointed Chief Herald. One of her most high profile cases was that of Charles de Gaulle’s Irish ancestry, researched in the 1960sfor the French president’s state visit to Ireland. The number of research commissions for the Genealogical Office was steadily increasing and it is to be remembered that, until the mid 1960s, the day of easily accessible genealogical and historical finding aids and indices, was yet to come, with the world wide web and digitised searchable primary source material not on the horizon. Eilish was a pre-internet genealogist and historian. During the 1960s Eilish was also teaching history to the Froebel students at Dominican College, Sion Hill, Blackrock, Dublin. Eilish had a strong sense of history and place and was also a good raconteur – all of which benefited the listener. For the small band of aspiring genealogists she was most generous with her time and knowledge and was instrumental in setting up a steering committee to set out standards and methods of research for professional genealogists which in turn led to the founding of Association of Professional Genealogists in Ireland (APGI). She served as President of APGI for its first ten years, and in 2004 was elected its first Fellow. She played an active role in several societies and associations: – Royal Society of Antiquaries of Ireland; the North Munster Archaeological Society; Irish Historical Society; The UCD Women’s Graduates Association (WGA); in 1997 she was elected a fellow of the Irish Genealogical Research Society (IGRS). Her Roman Catholic religion was central to her daily life; without any fanfare, during the years when annual sales of work were held at the Mansion House she took up her position at the stalls and usually persuaded a colleague or two to assist! She participated in and was subsequently president of an Apostolic Work circle for which she was given due recognition by the Vatican. For Coimisiún Lámhscríbhinní na hÉireann/ Irish Manuscripts Commission (CLÉ/IMC)Eilish Ellis contributed ‘State-Aided Emigration Schemes from Crown Estates in Ireland c 1850’ to Analecta Hibernica No. 22 (1960), and with her friend and colleague P. Beryl Eustace, edited Registry of Deeds, Dublin: Abstracts of Wills 1785-1832, volume III (1984).